This is by far the most common cookware in homes and restaurants. Stainless steel pots conduct heat quickly. If you choose ones with a magnetic bottom (e.g. made of cast iron or magnetic stainless steel), the pot can also be used on an induction stove top which cooks about 50% faster than gas or electric stove tops. How do you know if your stainless pot has a magnetic bottom? Simply take a magnet and see if it sticks to your pot bottom and side. If it sticks, your pot is induction-cooktop ready. Pots made of stainless steel are also durable, easy to clean, and easy to maintain. Many are dishwasher-safe. If the surface gets scratched, needs a good scouring, or just need a general polish, I have found that a cleaning powder like Bar Keepers Friend or Kleen King works excellent on stainless steel cookware. I even use it to clean and shine my stainless steel kitchen sinks. 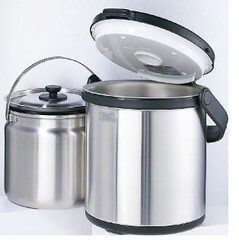 Stainless steel pots also come in many different sizes. To make soups for a family of 4 (or about 8 servings), a 6 – 8 quart (5 – 7 liter) sized pot is ideal. Remember that you will need a bigger pot to account for the liquid volume displaced after your poultry and other soup ingredients go in. If you make herbal or Chinese medicinal soups, a clay pot should be used instead. Certain, not all, Chinese herbs react with metal. It is better to be safe and use a clay or stone cookware instead. 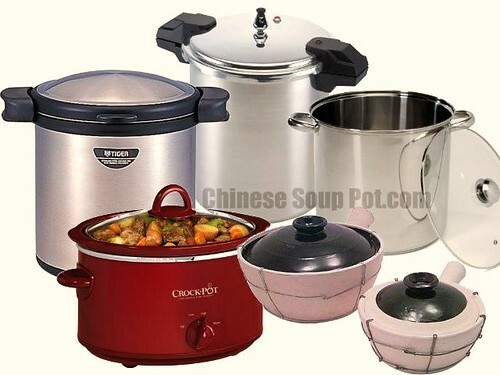 Top brands of stainless steel pot makers include: All-Clad, Cuisinart, and Calphalon. 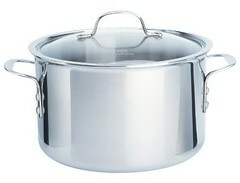 See more in this list of stainless steel stock pots. Clay pots are a more traditional cookware that provide a rustic look. They are functional and lovely to look at, giving the convenience of serving directly out of it on the dinning table after cooking. Clay pots keep food warmer longer. In the cold seasons, they can keep food warm throughout the meal as you eat. Clay pots can go from stove top to dinning table, to refrigerator, microwave, and back to the dinning table. This is convenient and saves on dish washing. There is no need to transfer left overs for storage in the refrigerator, for reheating in the microwave, or to serve again on the dinning table after reheating. Just remember to introduce temperature change gradually to avoid cracking the clay. Food and soups made in clay pots develop a superior taste. Clay is a naturally porous material which enables even heat distribution. Flavors are developed slowly and blended with all of the ingredients as they cook. And as ingredients caramelize and sear in clay pots over fire, a special flavor and aroma is formed that is unique to clay pot usage that cannot be reproduced in stainless steel cookware. Once you’ve tasted food made in clay pots, you won’t want to go back. Chinese clay pots, also called Sand Pots (沙煲), are designed to be used directly above fire on a gas stove. Sudden temperature change will crack the clay. Special care is required to extend the life and usage of a clay pot. Follow the manufacturer’s instructions carefully, and read my post on Clay Pot Use and Maintenance Tips. Look for quality brands with labels that indicate the paint or glaze is lead-free. The Japanese are known to make some of the highest quality clay pots. If you want to learn more about the history of sandpot cooking in China, I’ve found that Flavor and Fortune’s Sandpot Cookery page is a good place to start. 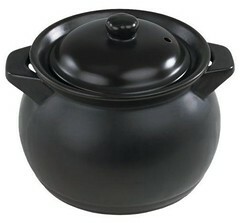 See a list of clay pot makers and their products. Slow cookers are a countertop appliance that is pretty easy to use. They do not require “baby sitting” while food is being cooked since they use low temperatures and come with tightly sealed lids. A heating temperature and/or cook time is also pre-set through a digital control panel, so you don’t have to be around to turn off the appliance at the end of cooking. Slow cookers cook at a low steady temperature ranging from 170˚- 280˚F that is powered through electricity. A longer cook time, 4- 12 hours, is required to make up for the lower cooking temperature. Inexpensive tougher cuts of meats actually do quite well in slow cookers and come out tender because of the longer cook time and low temperature cooking. Slow cookers are not the most energy efficient and can eat up a lot of electricity over the extended cook time. Slow cookers are good for making stews or one-pot meals, but in my opinion, not ideal for making good Chinese soups. These cookers usually let you preset one low temperature throughout the entire cooking process. To make good soups, temperature change is required for hard boiling or simmering. 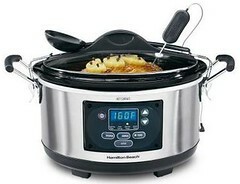 Top brands for slow cookers include Crockpot, Hamilton Beach, and Cuisinart. See more choices from this list of slow cookers. Vacuum cookers, also called thermal cookers, are a newer cookware developed in Asia and introduced to the Asian market in the mid 1990s. They quickly became a big hit since they are the most energy-efficient method of cooking. They are especially popular with the Cantonese since many of their home-made dishes require prolonged braising and simmering. Vacuum cookers have an outer container which is called a vacuum flask. The flask holds and seals in an inner removable stainless steel pot which has its own handle and lid. The inside stainless steel pot is where ingredients go into and cooked via the stove top for the first 15 – 20 minutes, or until the ingredients boil or reach appropriate cooking temperature. At that point, the covered stainless steel pot is transferred and sealed inside the insulated vacuum flask which holds that temperature for several hours to continue cooking. This way, vacuum cookers use significantly less energy than other cooking methods. Vacuum cookers come in different sizes and are easy to clean. They also require very little maintenance and are very durable. Since the inner pot is sealed in, very little evaporation occurs. This means better preservation of nutrients and flavor, and less reduction of liquid. Use just enough water when making soups in a vacuum cooker. Like a slow cooker, a vacuum cooker does not require “baby sitting” to watch for spillage or fire hazards. Liquids will not spill over since the inside pressure does not continually build up as with traditional cooking. On the flip side, soups typically take 6 – 8 hours to be ready. But this doesn’t deter me. I prepare my ingredients the night before and let them cook overnight. This way, I have hot soups to enjoy when I wake up the next morning. Or, I put the ingredients in at morning. After I get home from work, I have hot soup ready for dinner. One downside about vacuum cookers is that food and soups can come out tasting a little blend. I believe the reason is a lack of constant firing and pressure build up to push flavors out of the ingredients. One way I’ve found to improve this is to cook my soup longer over a stove, about 45+ minutes, before transferring into the vacuum flask. Top brands for vacuum thermal cookers include Tiger, and Zojirushi. See more from this list of vacuum thermal cookers. Pressure cookers are stainless steel pots with strong metal locking lids that seal in air and steam to a preset pressure point during cooking. As liquid evaporates inside the vessel, pressure builds up to allow temperatures to raise significantly higher than under normal conditions. This extremely hot steam cooks food much faster, about 1/3 the time needed with conventional cooking methods. Since air and steam do not escape from the pressure cooker, less water is required for cooking. This means less nutrients leach away into the cooking water, and vitamins are better preserved since the cook time is shortened. Pressure cookers are effective sterilizers also since they cook above normal boiling point (100 C at sea level). On the flip side, pressure cookers should be used with caution. Manufacturer’s instructions and pressure cooker specific recipes should be followed carefully to avoid accidents. These cookers can become dangerous as high pressure builds up. Pressure cooker lids should be inspected regularly. The ring casket in these lids that provide air-tight seals can wear out. When this occurs, the casket should be replaced so the pressure cooker can function properly. The ring casket can also dry out which makes opening or closing the pressure lid difficult. To prevent drying, rub oil on the ring casket regularly as a maintenance routine. Another drawback is that checking your cooking progress is more involved with pressure cookers. Since metal lids do not allow you to peer inside the pot, the pressure cooking process will need to be halted and the pressure properly released before the lid can be opened to inspect food. Top brands for pressure cookers include: Presto, All American, and Fagor. 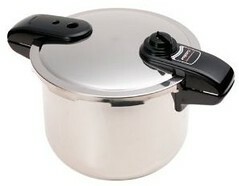 See more from this list of pressure cooker products. Now that you know a little more about the pros and cons of these 5 common cookware, which is the best you ask? I personally use stainless steel, clay, and the vacuum cooker. I use the stainless steel because it is so easy to use, require little maintenance, and comes in so many different sizes to fit the cooking occasion. I have one that is also induction stove top ready and I can’t wait to get my hands on a portable induction cook top that I’ve been contemplating. I use a clay pot also because my husband loves anything that is cooked in a clay pot. Food and soups made in this stoneware really does taste so much better that it is worth learning how to cook with one. See my tips on preparing, seasoning, and maintaining your clay pot to extend the useful life of your clay pots. I often wish that I can use it more to make soups. But after looking high and low, the biggest size I’ve found of decent quality is a 6 qt, which is still a little small for me to make soups. If you know of a quality, lead-free, 8+ quart sized clay pot, I would love to hear about it. Leave a comment below and let all of us know. Thank you in advance for sharing! Last but not least, I use the vacuum thermal cooker because it is such a green way of cooking. Having one of these around can really help reduce your total energy usage. My soups cook about 1/3 to 1/2 the time on the stove, and finish off in the vacuum flask. Soups come out tasting just fine this way. To choose the best soup pot that is right for you, I encourage you to think about what is important to you and your lifestyle. Is being able to produce the best flavor the highest calling for you? Or do you value convenience and low maintenance cookware that saves you time? Is cooking in an energy-efficient manner an important factor? It is these subtle details and differences that should guide you to your own personal decision. Share your thoughts by leaving a comment below. Have you found a good, safe clay pot larger then 6 QT? I, too, would love to find an 8 QT when I want lots of tasty soup! !